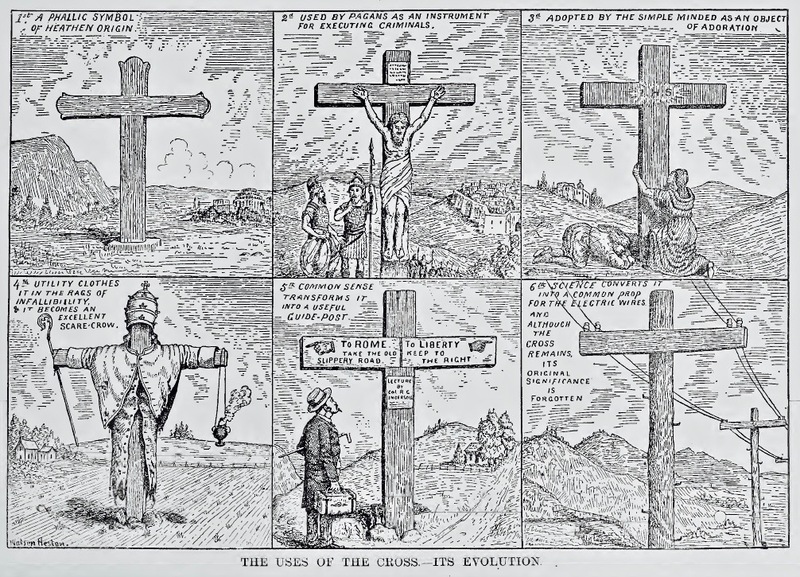 Image: Watson Heston, The Uses of the Cross, in The Freethinkers’ Pictorial Text-Book (1896). 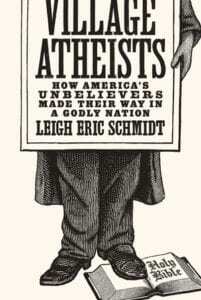 Village Atheists: How America’s Unbelievers Made Their Way in a Godly Nation. By Leigh Eric Schmidt. Princeton University Press, 2016. 360 pages. $35.00 (Hardcover). Among the most notable trends in recent American religious life is the emergence of the religiously unaffiliated as an increasingly numerous and influential demographic segment. Documented mainly through Trinity College’s American Religious Identification Survey (ARIS) and studies by the Pew Research Center, “Nones” (those who respond “none” when asked about religious identification) carry the lede in story after story about the religious character of the U.S. populace. Increasing from just over 16 percent of the adult population in 2007 to nearly 23 percent in 2014, those who claim no religion mark a newly significant societal trend. And they seem to be reshaping the national polity in definite terms. But the lack of religious affiliation isn’t novel in American culture. Atheists, agnostics, and the otherwise irreligious have long hovered in the cultural background, haunting Christianity’s dominance with freethinking skepticism. Towards the end of the nineteenth century, especially, “freethought” emerged as a hyper-rational viewpoint that prioritized individual practices of empirical observation and logical argument. Embodied prominently in the career of traveling lecturer Robert G. Ingersoll (1833–1899), freethinkers included agnostics, atheists, and those with generally skeptical attitudes towards religious authority. As a movement, freethought challenged constructions of the United States as a Christian nation. In a recently published history of what he calls “unbelief” in the United States, Leigh Eric Schmidt situates the nation’s skeptical past in relation to its reliance on religion as a line of civic demarcation. In doing so, he recovers the “village atheist”—a rabble-rousing, nineteenth-century figure who denied Christian authority, advocated for strict church-state separation, championed scientific rationalism, and dreamed of civil equality—as a forgotten cultural type that marked American religion through negation and provocation. One of the subtlest and most insightful chroniclers of U.S. religions over the last dozen years Schmidt has attended to liberal formations of American spiritual life. Village Atheists: How America’s Unbelievers Made Their Way in a Godly Nation expands his work beyond the limits of liberalism to consider a more radical set of “rogue” and “rough-edged figures” who rode along the borderlines of the nation’s religious landscape. Spanning from the 1870s to the 1960s, Schmidt’s study stitches the story of unbelieving Americans into the main narratives of the U.S. religious past. His characters encounter liberal Protestants and the denominational skirmishes that accompanied their late-nineteenth-century articulations. They run across evangelicals and nascent Fundamentalists battling to hold intellectual and political sway at traditional centers of theology and morality. And they meet one another, at times allying in collaborative ventures and feuding over tactics and reputation. In four sequential chapters and an epilogue, Village Atheists traces the cultural and intellectual lines that drew Schmidt’s subjects together across the continent and through decades. To cut through the thicket of materials produced by nineteenth-century unbelievers, he narrates his analysis through biography. In a “pointillist group portrait” of four principal figures, he “teases out a history tugged between…a Christian majority and the imperfect liberties of a secularist minority.” Their lives intersected primarily in the pages of the Truth Seeker— freethought’s main periodical from the 1870s through the early twentieth century—and Village Atheists culls its contents to form a consistent narrative of infidelity in U.S. culture. The first in Schmidt’s biographical quartet, Samuel Porter Putnam (1838–1896) illustrates the mentality inhabited by those secularists who transited the gap between evangelical Protestantism and confirmed atheism. A prominent writer and lecturer on the freethought circuit, Putnam ricocheted from childhood Calvinism to a youthfully naïve atheism as an undergraduate, then bounced between various stripes of Unitarianism, finally settling on scientific materialism in his maturity. This trajectory furnished Putnam with a mentality that encompassed the contradictions between traditional Protestantism and skeptical atheism. As he reinforced a burgeoning irreligious subculture by leading the American Secularist Union and publishing atheist-themed stories in the freethinking press, he helped to shape a tradition and construct a sense of identity for unbelieving Americans. In doing so, Putnam opened opportunities and furnished resources for carrying out the conduct of life apart from, even if imprinted by, normative Christianity. 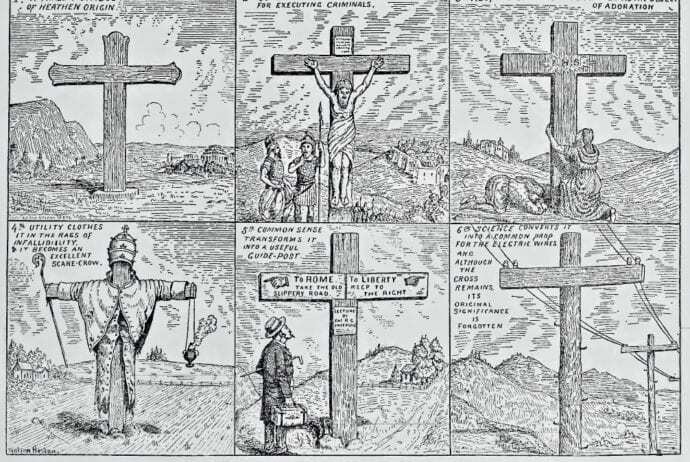 Less bound to the cultural baggage of a Christian background, Watson Heston (1846–1905)—the cartoonist-iconographer of turn-of-the-century freethought and the subject of Schmidt’s second chapter—provides a case in cataloging the criticisms and concerns advanced by secularists in graphic form. Working from his desk in Carthage, Missouri, Heston authored more than 600 cartoons that were printed on the cover of the Truth Seeker between 1885 and 1900. As portrayed in Village Atheists, this body of visual rhetoric “produced an incomparable iconography of American secularism” in which Heston presented “the visualization of a secular republic…designed to render freethinking liberalism tangible.” Always confrontational, Heston’s images excoriated Christianity for its perceived hypocrisy and cruelty, and drew both praise and disdain from the ranks of fellow skeptics for the aggression of their messages. In Schmidt’s analysis, the dynamics behind Heston’s representations pointed to liberal secularism’s inner complexity. Unsure of the best strategy for publicizing their views, unbelievers quarreled over both the message and the medium. Should unbelievers attenuate their antireligious polemic and the belligerence of their tone? Should freethinkers hew to the rationality of words and deliberative argument, or could the shorthand mode of cartoon fairly broadcast their claims? Testing visual media against oratory and literary expressive forms, Heston found that graphical polemics possessed the most power. But his pugnacious content risked reprisal from opponents and alienating potential sympathizers. Even so, Schmidt’s cartoonist regularly landed on the side of visual bombast. Aware that atheism “looked more like a tiny, ostracized faction than a surging tide,” Heston demonstrated self-awareness of irreligion’s marginality, but nevertheless remained uncompromising in maintaining the “rough edges” of his confrontational imagery. In similar measure, Elmina Drake Slenker’s career marked the boundaries that restricted freethinking speech and activism, cut off when they reached too near the edges of sexual and marital norms. Where Reynolds and Putnam experienced restrictions based on accusations of blasphemy, Slenker encountered resistance because her critiques of marriage and sexuality were considered obscene. As an author of freethinking sentimental literature, Slenker “strove to depict strong, atheistic women who were quite capable of persuading anyone they might encounter to exchange threadbare theology for scientific rationality.” But norms of “male privilege and masculine presumption”— both within and apart from liberal secular circles—limited Selnker’s ability to realize the ideals of atheist feminism. Publishing anatomically frank language in her fiction and activist writing, Slenker was pursued by allies of Anthony Comstock’s Society for the Suppression of Vice and prosecuted for violating anti-obscenity codes. By raising questions of sexuality and gender, Slenker found herself flung to the far edges of the atheist avant-garde, abandoned by all but the most radical of her fellow freethinkers. Through Slenker’s story, Schmidt illustrates both the extremity of opposition to unbelief in the United States and the limited extent to which unbelievers themselves were willing to question traditional constructions of gender and marriage. Village Atheists concludes with an epilogue that considers how these four figures established patterns that carried forward into the twentieth century. Emphasizing Supreme Court jurisprudence, Schmidt links nineteenth-century narratives to battles over compulsory religious expression in public schools and other hallmark issues that came before the court between the 1940s and 1960s. In all, Village Atheists provides an exemplary consideration of the cultural significance of its titular typology, and this marks its most distinctive contribution. Where other historians have described the intellectual history of American unbelief and given that history an activist bent, Schmidt delivers a disciplined cultural historiography. Village Atheists considers the broader symbolisms and significance of unbelief in the everyday life of the turn-of-the-century nation. As he explains it, “[t]he religious estrangements that vexed [American freethinkers] were not philosophically abstracted; they were visceral, relational, and densely particular.” America’s secularists emerged authentically from the dynamics of social and cultural life, just like all others. That Schmidt places them in their complex relationship to normative practices and perspectives is the principal value of a cultural history of unbelief. With respect to a broader understanding of U.S. religious cultures, Schmidt’s exploration of the archive of American unbelief sharpens and clarifies the narrative and expands its contour. “The underlying presumption,” Schmidt observes, “that the nation’s history must be headed one way or another—through an unfolding process of secularization or Christianization—remains hard to relinquish, but the history told here purposefully occupies the uneasy space between those persistent narrative devices.” Recalling the cultural type of the village atheist helps Schmidt’s reader to reconsider the meaning of religion in the U.S. past, cracking open any certainty in determining of the meaning of Protestantism’s normative sway and the cultural position and perception of religious minorities. As U.S. Christianity’s anti-type, the village atheist frames the undetermined character of American religion more clearly. Much like the surging numbers of “nones” in the current moment, the rabble-rousing skeptics of the 1800s pointed to the ambiguity of religious affiliation and disaffiliation. Atheist, Christian, or otherwise, religious and irreligious labels have long marked the boundaries set around public power and civic belonging. In Village Atheists, readers will find a powerful meditation on the tension between belief and unbelief in the long project of collective identity formation in the United States.